Over the last decade, Chinese officials have been very good at staging public events designed to spotlight their growing presence in Africa, assure African leaders of their good intentions, and remind their African hosts and global competitors of the strength of their position in Africa. See, e.g., 2006 Beijing Summit of the Forum on China-Africa Cooperation. "At the 2009 Forum on China-Africa Cooperation (FOCAC) held in the resort town of Sharm el-Sheikh in Egypt, Beijing committed to 10 billion dollars in low-cost loans and an additional one billion dollars in loans to support the growth of small and medium African enterprises. " Antoaneta Becker, China-EU Rivalry in Africa Sharpens, IPS News, June 15, 2010. See Larry Catá Backer, “The Problems of Being a great Power: China and Neo-Colonialism in Africa, Law at the End of the Day, Nov. 22, 2006. But increasingly, these fora are being held for the further purpose of damage control--to counter perceptions in Western media that China's investment in Africa is not all positive. Some of the reports have been embarrassing to the Chinese leadership. See, e.g., Sebastien Berger and Malcolm Moore, Hu Jintao's son linked to African corruption probe, Telegraph (UK), July 17, 2009 ("Three people have been arrested in the country on charges of fraud, corruption and bribery involving a government contract with the state-owned Chinese company Nuctech, a world leader in scanning technology. Hu Haifeng, 38, was the president of the firm until last year, when he was promoted to being the party secretary of Tsinghua Holdings, the group which controls Nuctech and 30 other companies." Id.). Chinese media has sought to portray Western media and government criticism of Chinese investments as jealousy from a group of states that find themselves unable to compete successfully in business against the Chinese. "The jealousy, or hostility from the West, comes not only from the expansion of the Sino-African economic and trade relations, but more importantly, the actual conflict of interests between Chinese and foreign enterprises induced by the increase of Chinese investments. . . . .As the Chinese companies have touched on the Western companies' "cheese", it would naturally evoke strong reactions from the rivals, and even caused some unexpected problems for Chinese investment in Africa." Xie Boyang: Public and Private Sectors Should Join Forces in Development, New Risks in African Investments , Forum on China-Africa Cooperation 2010/06/08 (From the 21st Century Business Herald, first published May 31, 2010). Also, Chinese officials have sought to suggest to those annoying problems that have affected Chinese enterprises in Africa, in many ways like those that plagued other global actors that appeared in Africa before them, are really of marginal consequence. Recent official media reports have been full of headlines like "the West envies China’s sway in Africa" (the Global Times) and "China and the West spar over diplomatic ethics in Africa" (Xinhua news agency’s website). Chinese companies have encountered upsets in several African countries where they have invested to gain valuable assets - being accused of turning a blind eye to corruption and violating local laws. All this has fuelled a climate of suspicion in China that the West is waging a covert war to frustrate China’s expansion in Africa. "China’s behaviour in Africa plays by the rules set by western powers themselves," said an article in the Chinese edition of Global Times. "While no western government can speak out publicly against China’s investment in the continent they have mobilised the media and various non-governmental organisations to find faults with China". Antoaneta Becker, China-EU Rivalry in Africa Sharpens, IPS News, June 15, 2010. Yet, African leaders have been happy to attend these celebrations and deal making sessions, but are not above criticizing their hosts after the fact. See, e.g., Larry Catá Backer, China and Neo-Colonialism in Africa: A Warning from South Africa, Law at the End of the Day, Dec. 16, 2006. Still, African leaders continue to do business with China and its investors. This pattern continues to repeat itself. The recently concluded 21st Century China Investment and Cooperation Forum provides a case in point. Wei Jianguo, a former vice commerce minister, said in Beijing on May 28 that now is an ideal time for Chinese companies to invest in Africa. Wei, secretary-general of the China Center for International Economic Exchanges (CCIEC) made the remarks at the 21CN China-Africa Investment and Cooperation Forum. "China-Africa cooperation is a win-win partnership for which China long ago laid a solid foundation," he said, citing the economic aid that China has provided for African countries since 1950s. Wei said China saw its trade volume with Africa increase from US$1 billion in 1992 to US$106.8 billion in 2008. Now, against the backdrop of China's fast-expanding economy, the role of the private sector has grown rapidly. Chinese private companies are a major force in African market, Wei said. Wei said 2,180 Chinese companies are engaged in 8,000 projects in Africa, mainly in infrastructure and agriculture. China is also involved in the new energy business, building solar power and wind power stations across the continent. Pang Li, Official: Now is the time to invest in Africa, China.org.cn, June 1, 2010. The Chinese are well aware of its bad press, especially with respect to its business practices in Africa. They are especially sensitive to issues involving the use of Chinese workers to displace Africans in host state projects. But the Chinese investment apparatus has now begun to counterattack. It has deployed its formidable media outlets to begin a campaign to counter the charges against the negative assessments of its African investments. For the Chinese this is a natural progression--from financial to economic investment to media interventions abroad, following the now well established policy of going out. strategy (走出去). See, e.g., Accenture, China Spreads Its Wings: Chinese Companies Go Global (2005). See the listing of media counter-measures (with links) provided at Forum on China-Africa Cooperation, Voices From Media. "China’s global political and economic aspirations are an important factor driving expansion abroad. In addition to building economic relations with more countries, China’s outward investment has a dual purpose of building China’s political capital and influence around the world. China’s chosen route to economic expansion has therefore been closely aligned with its strategy to strengthen its global political presence. In particular, for some time, business and political leaders have worked in tandem to build strong relationships with developing countries" Id., at 3. Thus, the 21st Century China Investment and Cooperation Forum was as much about confidence building and image enhancing as it was about deal making and financial incentives from the Chinese state apparatus. ‘The 21st Century China-Africa Investment and Cooperation Forum’ held in Beijing on May 28 revealed China was shifting gears to engage more players in its dealings with African countries, courting relations with commercial associations and social groups beyond the immediate ruling elites. "Chinese media needs to ‘go out’ too and explain to African people what China’s development model is all about," Xie Boyang, vice-chairman of the China-Africa Business Council, was quoted as saying at the forum. Xie claimed the absence of Chinese media in Africa meant that its investment there was being misrepresented by western media as "the return of colonialism". Antoaneta Becker, China-EU Rivalry in Africa Sharpens, IPS News, June 15, 2010. Among the items of news coverage were those stories meant both to humaize the relationship between China and Africa and to suggest the power of the Chinese within that relationship. Lin Yi, secretary general of The Chinese-African People's Friendship Association, told a very popular "story" in Africa. An African child asked mom, "Where does God live?" Mom replied, "What do you think?" The child said, "God created all things in the world, and there are so many things in our home that are made in China, so I think God must live in China". Lin Yi believed that since the founding of People's Republic of China, generations of Chinese leaders had always valued China-Africa cooperation on the basis of mutual benefit. These efforts have cultivated a deep friendship. "Today throughout Africa, Chinese people are treated with respect and welcome, much more so than in Europe and America. It is possible to say the 50 years of China-Africa friendship is the most precious asset. How to best leverage this asset is something worthwhile for our enterprises and investors to think about and study on. Reporting from the 1st Conference of 21st Century China-Africa Investment and Cooperation Forum, China Economic Herald, 2010-6-18. What emerges is not just the human side of the story, but the inadvertent vertical dimension of that relationship, at least as understood from the Chinese side. Still, Chinese missteps are not entirely denied. "It can be seen that familiarity with local investment environment is very important for the Chinese enterprises in Africa. It is not only to understand the customs of local population, or to build schools and do charity to win over community cooperation, but it should be more in-depth understanding of the local laws and regulations and be familiar with the operation of local governments." 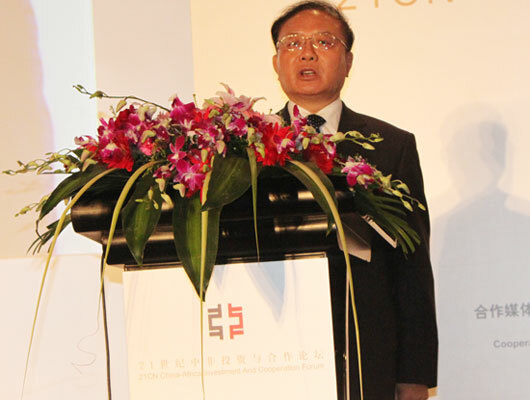 Xie Boyang: Public and Private Sectors Should Join Forces in Development, supra. On the one hand, international community should make positive efforts and give more considerations to the will and demands of developing countries so as to promote the establishment of a fair and rational new international economic order. On the other hand, developing countries should build up a sense of self-protection, learn to make correct assessment of situation; they should prevent and convert risks, revitalize and develop national economy and safeguard economic security by formulating economic policies which conform to their national situations. Facing the new century, China is willing to work with African countries to expand common views, deepen cooperation and speed up development so as to continuously sharpen the competitive edges and have the initiative in competition. Shi Guangsheng, To Intensify China-Africa Cooperation for a Brilliant Future-- Speech by Minister SHI Guangsheng of MOFTEC In the "Forum on China-Africa Cooperation"(2000/10/11). Still, what is clear is that the Chinese are offering Africa a potent brew--economic cooperation with a super state that tends to share its political views against its former colonial masters, and its sensibilities in matters of human rights and social organization. "China is the largest developing country and Africa is home to most developing countries. China-Africa cooperation is an important part of the South-South cooperation. The Chinese Government is firmly committed to strengthening its friendly cooperation with Africa and supporting Africa in achieving peace and development." Strengthening New China-Africa Strategic Partnership, Promoting Peace, Security and Sustainable Development in Africa (2010/05/26), Speech by Ambassador He Yafei at the Second African Forum for Dialogue (25th May 2010, Grand Hotel Kempinski). China means to deploy a host of states to assert its international position in the global institutional order. For that purpose it needs a substantial number of client states. Africa offers China a path to the realization of that objective. "Only by uniting themselves can developing countries enhance cooperation in all areas, raise up their status in South-North dialogue, effectively participate in the formulation of international rules and better protect their own interests. Under the circumstances of economic cooperation, further intensification of South-South cooperation enjoys spacious room for development." Id. For Africa it suggests another round of exploitaiton. The Chinese exploitation of Afrika is a further blow to the economic emancipation of Afrika. Do not be fooled by the Chinese protestations that their relationship with Afrika is based on mutual trust and respect unlike the Western/American exploitation of Afrika. Fundamentally the new Chinese invasion in Afrika is part of the New World Order where there is a struggle for global supremacy economically and access to Afrika’s raw materials is key to this. Furthermore the Chinese “interest” in Afrika is purely for the survival and economic interest of the Chinese and NOT the economic emancipation of Afrika. . . . However what the readers should be aware of is that the Chinese invasion of Afrika is another form of imperialism/colonialism similar to the Western/American model. In Angola, for example, China’s recent $2 billion and $2.4 billion Eximbank credit lines were tied to infrastructure investments but the insidious nature of these investments is that the Chinese send in their own people to work on these infrastructure projects with many local Afrikan talent being sidelined. Kwame Osei, The China/Afrika Relationship – A New Form Of Economic Enslavement?, Zambian Watchdog, Aug. 3, 2010. African leaders might see Chinese investment as a means of playing another super power off against Europe, Russia and the United States. The Chinese see a means of increasing their prestige, augmenting their power in international organizations by the control of a larger number of client states, and African elites see a way of increasing sources of foreign investment without the annoying conditionality of the IMF or Developed States ideological orders. Yet, to some extent, the Chinese are right--part of the Western response to their aggressive movement within Africa has been the result, at least in developed states, to the perceived threat to their influence in Africa. More generally, much to their consternation, traditional Western actors are finding that their once undisputed influence and dominance of Africa is being challenged by aggressive Chinese MNCs in collusion with the state. . . . The dilemma thus facing Western MNCs and donors, as well as African governments and concerned civil society actors, is how to successfully preserve their economic interests without undermining the structures and emerging institutions which, at least in their view, are crucial to building successful market economies within the framework of a liberal constitutional state. . . . However, there is evidence that the Chinese MNCs are, as part of their desire to emulate established global MNCs, in the process of embracing aspects of the corporate responsibility agenda. . . . Indeed, even critics admit that if one sets aside the particular cases of Sudan, Angola and Equatorial Guinea, ‘the rest of PetroChina and Sinopec activities on the African continent are not especially reprehensible’ or at least no more so than many of their Western counterparts. In the long run, perhaps it is this drive to emulate Western ‘best practice’ that will be the determining factor in Chinese corporate conduct in Africa. Chris Alden and Martyn Davies, Chinese Multinational Corporations in Africa, 2006. And thus the dilemma for the West--and for Africa. In the end, Africa may be trading one set of dominating actors for another. And a larger dilemma for Chinese enterprises. In order to succeed in Africa, there will be significant pressure for Chinese firms to conform to the rules of overseas investment that has prevailed in Africa for a generation. That may require a substantially greater willingness to hire local workers, avoid corruption, transfer technology, and avoid exploitation of local conditions--all of the complement of concerns that have plagued relations between Western multinationals and African states. In the end there may be little different between this wave of investment and those that preceded it. The pattern is beginning--accusation, followed by denial by the African leadership, and augmented by a targeted media portrayal in defense of the investing state. "Zambian Foreign Minister Kabinga Pande has slashed a recent media accusation that China's aid to Africa leads to the continent's government corruption and huge debts, saying it is ungrounded. "It's unfair to say that China's aid to Africa leads to corruption and huge debut," he told Xinhua in an exclusive interview at the sideline of the ongoing 15th African Union summit in Uganda's capital of Kampala. "China's loans are soft loans. There is no serious or difficult conditions attached to that and there is no string attached to the loans from China," he said." Unfair to say China's aid leads to Africa's corruption, huge debts: Zambian FM, Xinghua, July 26, 2010. Not that this is wrong--just to be expected. What makes it different from the sort of investment that came before it is the substantial involvement fo the state, and the coordination between state and overseas investors with respect to the character, quality and scope of investment, as China forges a fifferent kind of private-public sovereign coordinated investment. Expect to hear more about Chinese overseas investment in the future.